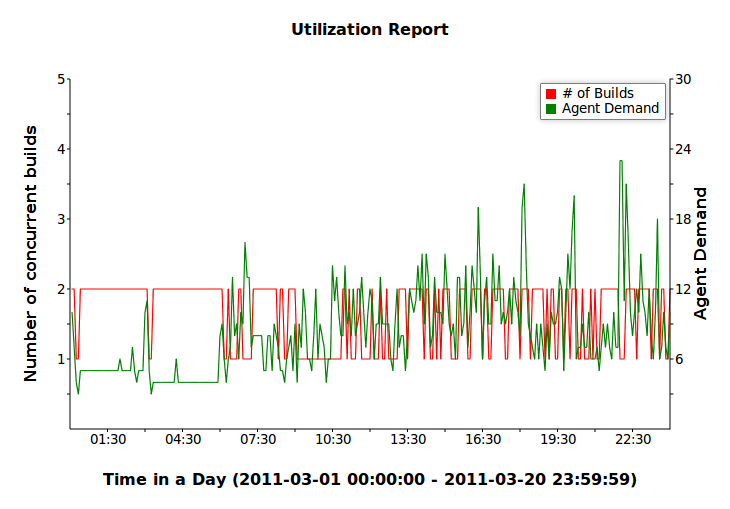 The Cluster Utilization report shows, over the course of a typical day, the average number of builds running and the average combined agent demand from all running builds. 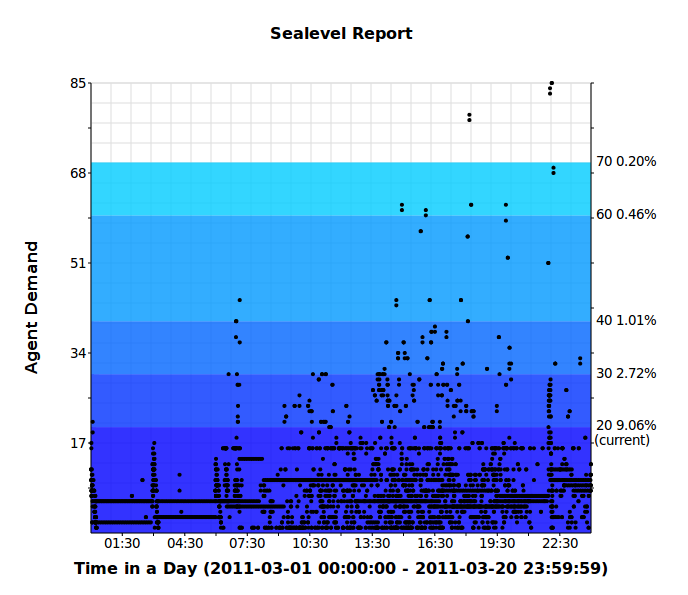 The Sealevel report shows the raw agent demand data, plotted over the course of a day. The colored bands correspond to various cluster sizes, including the current cluster size and several hypothetical sizes, so you can see at a glance how large you need to make the cluster in order to satisfy all the agent requests. The percentages on the right side of the graph indicate the portion of agent requests that are left unsatisfied with a cluster of the given size. In the example above, all but 1% of agent requests would be satisfied if the cluster had 40 agents. It’s a common way to ensure the output directory exists before trying to create a file in it. Unfortunately, with a strict application of Accelerator’s conflict detection algorithm, this pattern causes numerous conflicts and poor performance when the build is run without an up-to-date history file. In Accelerator 5.4.0, we improved the algorithm so that this common case is no longer considered a conflict. If you always run with a good history file, this change will not be helpful to you. But sometimes that’s not possible — for example, if you’re building third-party code that’s just gotten a major update — then you’re going to really love this improvement. The Android source code is a perfect example: a from-scratch no-history build of the Gingerbread base used to take 144 minutes. Now it runs in just 22 minutes on the same hardware — 6.5x faster. The last feature I want to mention here is the new sandbox implementation for Linux. The sandbox is the means by which Accelerator is able to present a different view of the filesystem, from a different point of time during the build, to each of the jobs running concurrently on a given agent host. Without the sandbox, it would be impossible on Linux to simultaneously represent a given file as existent to one job, and non-existent to another. In previous versions of Accelerator, the Linux sandbox implementation was effective, but ultimately limited in its capabilities. Chief among those limitations was an inability to interoperate with autofs 5.x. There were several workarounds available, but each of those in turn had its own shortcomings. Accelerator 5.4 uses a different underlying technology to implement the sandbox component: lofs, the loopback filesystem. This is a concept borrowed from Solaris, which has had a vendor-supplied version for years; Linux has nothing that matches the depth of functionality provided by Solaris, so we wrote our own. The net result of this effort is that the limitations of the previous implementation have been entirely eliminated. In particular, Accelerator 5.4 can interoperate with autofs 5.x without the need for any workarounds or awkward configuration. It’s been a long time in coming, but I think it was well worth the wait. I’m very proud to have been part of this product release, and I’m thrilled with the work my team has put into it. Accelerator 5.4 is available immediately for current customers. New customers should contact sales@electric-cloud.com.